When you visit Copper Canyon Dental in Gilbert, Arizona, your smile is our top priority. Our entire team is dedicated to providing you with the personalized, gentle care that you deserve. Our dentist, Dr. Mitchell Lepetich and his staff will take the time to explain all your treatment options to create the best smile for you. Patients love our warm, inviting office and can trust the care that they receive. That is why they bring their family to Copper Canyon Dental and refer their friends and co-workers too. We invite you to take a look at our website and stop by and visit our office and see the amazing service that we offer every patient! Dr. Mitchell Lepetich takes great pride in providing excellent treatment to all his patients. Your comfort, health, and beautiful smile is our highest priority. Dr. Lepetich will thoroughly explain your treatment needs and all options in a honest, upfront manner and prioritize your treatment plan according to urgency. We complete dental exams and explain using digital X-Rays and intraoral photos. We provide exceptional service from our highly experienced, gentle, and friendly office staff. Only the highest quality materials is used in our state of the art facility. 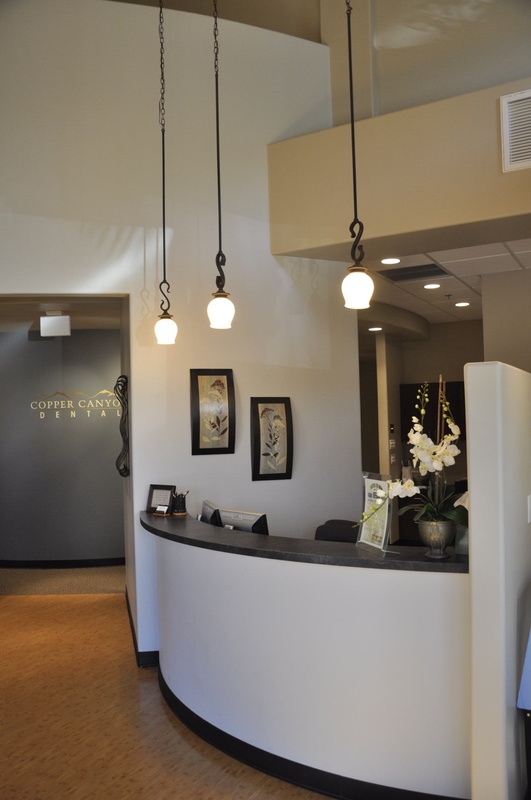 We designed our beautiful Gilbert dentistry with our patients comfort in mind. We offer amenities such as comfortable dental chairs, blankets, pillows, beverages and videos to watch or music to listen to during your treatment. We offer treatment options for you and your entire family. Dr. Lepetich enjoys treating patients of all ages, and is very caring and patient with children. Our staff is trained in the best procedures to create a beautiful, lasting, and quality smile. Our services include high quality porcelain aesthetic crowns and bridges, dentures, tooth-colored fillings, root canals, Zoom! Whitening, Digital X-rays, Nitrous Oxide (laughing gas), oral conscious sedation, and emergency treatment. For our latest specials, please follow this link. Gilbert Dentist, Copper Canyon Dental is a local Arizona family and cosmetic dentistry practice serving the communities of Gilbert, Chandler, Mesa, and Queen Creek AZ. Our dentist and dental office assistants are friendly, knowledgeable, gentle and of course experienced. Dr. Mitchell Lepetich, DMD is a dentist you can trust with you and your family's dental needs. Dentist clinic services include checkups, cleanings, digital x-rays, Zoom teeth whitening, emergency dental treatment, root canals, crowns, bridges, dentures, implant supported dentures, white fillings, resin-based restorations, periodontal therapy, extractions and more.